Imagine standing at a 45 degree angle to what your perception of gravity is supposed to be. Imagine having your ideas of gravity be challenged as you go out to hike and explore. All of that is possible with a visit to the Santa Cruz Mystery Spot. Originally opening in 1941, it is located in the redwood forests just outside of the city and is billed as a “place of gravitational anomalies.” Tours are limited, so online reservations are highly recommended if you are planning a trip in advance. What Makes the Mystery Spot So Bizarre? Though the Mystery Spot in Santa Cruz is far from the largest tourist destination you may ever choose to visit, it will certainly be one of the most memorable. Your perspective of reality is immediately questioned as you walk toward the main building. Everything seems to be tilted, slanted, or just “not right” in some unique way. Is it a vortex of magma? A spaceship that has been buried in this specific spot? Though the claims might seem to be outlandish, one thing is for certain: people come from all over the world to Santa Cruz to specifically visit the Mystery Spot and keep returning year after year. It’s Not the “Solved Spot…” It’s the Mystery Spot! Plan to spend about 45 minutes on a guided tour at the Mystery Spot. You’ll get to see plenty of variations of gravity that really will make you question your knowledge of physics! There’s also hiking trails around the area that explore the redwoods in the area, a eucalyptus grove, and is surrounded by beautiful oak trees too! for you to explore after your tour so that you aren’t planning an entire trip for just a 45 minute tour! Snacks and other facilities are on site for your enjoyment. Even if you decide that the Mystery Spot isn’t for you, there’s plenty of awesome sights to see in the Santa Cruz area. If the weather is nice, you can never go wrong with a visit to the beach, which is only 10 minutes away from the Mystery Spot. On a grey, rainy day, a drive through the redwood forest is the perfect way to explore. How Much Is It To Visit the Mystery Spot? Because the guided tours are limited, the Mystery Spot recommends that you purchase your tickets well in advance before your trip. This can be done over the phone or online. Tickets are $6 per person, though children under the age of 3 are free. There is also a $5 parking fee to consider as well. Plan on arriving at least 30 minutes in advance of your scheduled tour time so that you don’t miss out on all the fun! 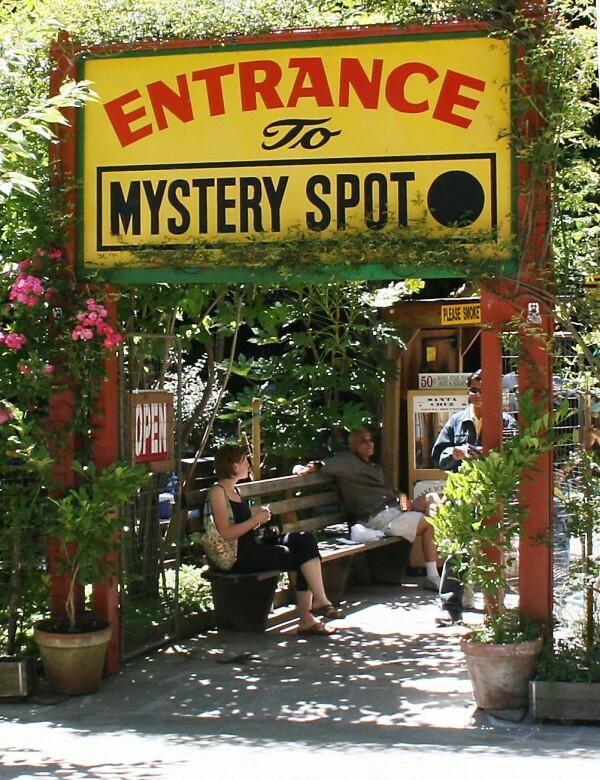 Best of all, the Santa Cruz Mystery Spot is open all year ’round for your enjoyment. If you are looking for one of the more bizarre tourist attractions to see in the State of California, the Mystery Spot will certainly deliver! Have you visited the Mystery Spot before? If so, what did you think of your visit?